Printed Stretch Crepe Fabric. Design Your Own Crepe Material. 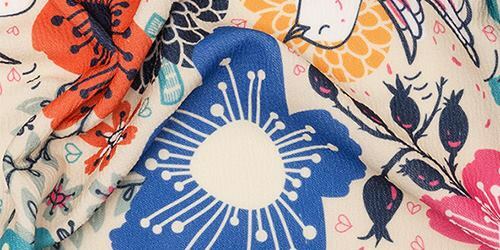 This stretch crepe fabric will add character and life to your designs. It has a springy and flexible nature, that makes it highly stretchy and comfortable to wear. This custom printed crepe fabric has the classic crepe texture on the face. However, unlike other crepes, the textured pattern runs on the diagonal, adding interest and personality. It has a solid construction and feels very substantial. The crepe stretch has a super soft back and is the ideal fabric for dress and garment making. Crepe is a beautiful fabric, not only to wear but to work with as well. Our stretch crepe is a substantial yet soft crepe, with a wonderful stretch and excellent color and print reproduction. Try crepe stretch for your next project. We promise you will love the results. The face of printed crepe stretch is somewhat dry and textured. What makes this material stand out is that the crepe texture has actually been created on the diagonal, which adds a unique and interesting aesthetic. It is quite crisp and can fray if not finished properly. A knitted fabric with a lot of character, this stylish textile is a dressmaker must-have. Stretch crepe fabric made has a beautiful white base tone. This is the ideal backdrop for color and detail, and both are reproduced with remarkable detail, depth and clarity, despite the textured surface. The 3% elastane content allows it to be very flexible, so prints are interrupted when overly stretched, but the brilliant recovery snaps them back to their original state in no time. 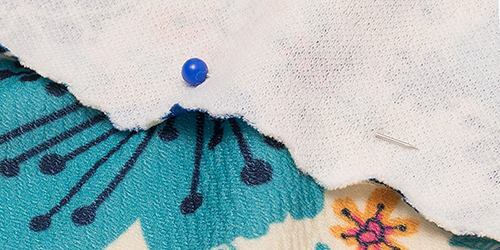 This fun and versatile fabric was made for garment making. It is very popular thanks to its myriad of qualities, ranging from flexible and soft to its excellent print reproduction. It lends itself to a wide range of end uses, many of which are clothing related. From dresses and blouses to skirts and scarves, this clever crepe works brilliantly for them all. Couldnt Have Been Better Absolutely perfect product, better than I could have hoped for! This coupled with the wonderful customer service and super speedy shipping means I will be shopping with Contrado again! How stretchy is this fabric? Our stretch crepe material is stretchy by name and stretchy by nature. It contains 3% elastane, which makes it extremely flexible and springy. This knitted fabric is particularly stretchy on the weft, but it also has a wonderful recovery. This means that designs are not compromised, despite the stretch and textured face. Will my design print well on this crepe? This stretch crepe material has a lovely white base tone, which is ideal for showcasing colors and details. The surface texture does not interfere with your design, and all details are depicted sharply, with colors warm, vibrant and punchy. Bold designs look just as beautiful as finely detailed ones. Is the back of the fabric the same as the front? The front and back of the crepe stretch are quite different. There is a slight see-through of around 10%, especially when held up to the light. The front of the fabric has a distinct crepe like texture on the diagonal. It is slightly more dry and crisp than the back, which is slightly softer and lacking the crepe finish.